Wade and Chaya are in Maine, USA. Read recent travelogue entries! for more than 9 years through over 45 countries on 5 continents. He is open to answer all questions - email Vagabondsong@gmail.com. Walk Slow. 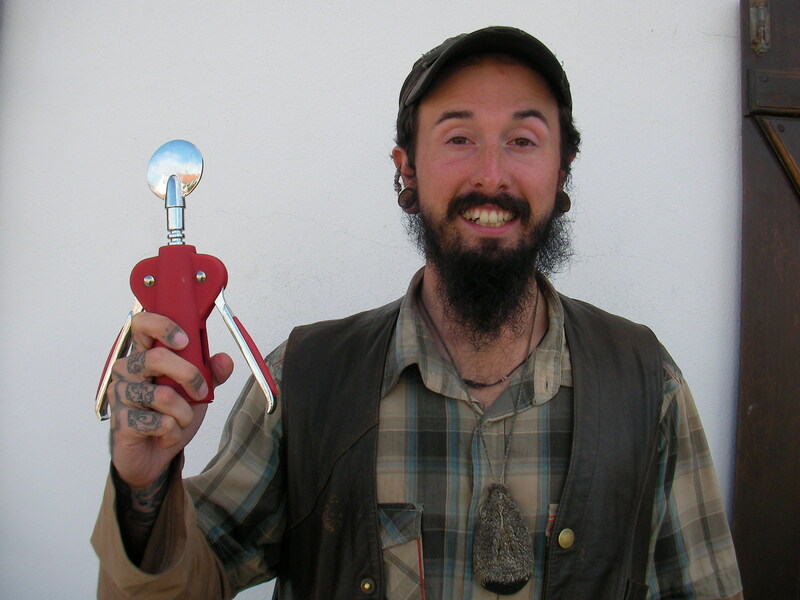 On November 1, 2007, Nath Richards of Ubertramp.com posted an article on his site entitled, The Swiss Army Knife: Just Another Travel Rip-Off, which provoked an entire mob of ardent travelers and knife fanatics to take up arms and stake out their positions on the real usefullness of the Swiss Army Knife. Many travelers and 100,000 knife enthusists bore their attack down upon Mr. Richards and claimed with stubborn pride that the Swiss Army Knife is among the greatest inventions since the wheel, while many other travelers were provoked into rethinking the pedestal upon which the multi-tool traditionally sits and took sides with Ubertramp.com. On this page are the collected articles and comments from this great debate. Packing for an extended trip away usually starts with me chucking everything I think I will need into a large pile. Invariably this pile ends up about the size of Mt. Kota Kinabalu, and invariably at around this point I glance over to an undersized empty backpack propped up against the wall, realise all this stuff will never fit, and let out a bit of a deflated sigh. I know it’s time to get ruthless. Now, 2 of the first items thrown in the Kinabalu pile would usually be a Leatherman tool and a Swiss army knife - and my first question would always be the same: which one do I take? I realise now the question should really have been: do I actually need to take either? And the answer – if you’re simply doing the general backpackery things that backpackers do - is a hard and fast no. For years I would take one of these money wasters yet use nothing on it apart from the knife. For years, I tell you. But there could well be a situation where you need one of the other items, surely? No. But you will be doing things a little out of the ordinary and it could be useful. Won’t you regret not taking it then? NO! I’m sure that these 2 questions alone have made the bosses at Swiss Army HQ very rich men indeed. 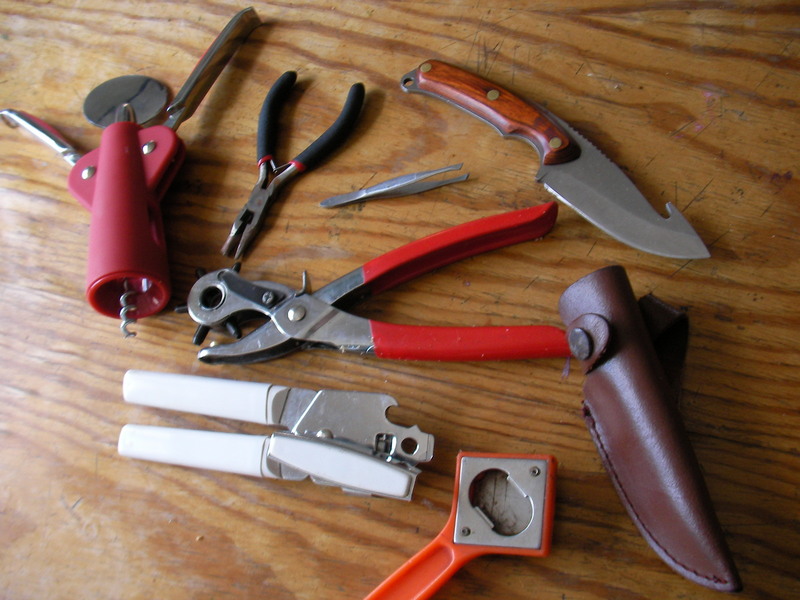 OK, I could be wrong, but consider this: a few years back even I worked for a while as an electrician in a Cambodian hotel and still didn’t use the bloody Swiss army knife! I’m serious! And if there was ever I time that I thought I would need one it would have been then. But I didn’t. The fact of the matter is that there always seems to be something else to hand that will do the job - some other solution – or another way of solving whatever problem you thought you needed the combination tool for in the first place. Each to their own, but I reckon you’d be better off saving the extra space and weight taken up by the combination of nail files, tweezers, bottle openers, corkscrews, screwdrivers, hooks, saws, magnifying glasses, fish scalers (?!? ),hex wrenches, pliers, clocks, digital altimeters, laser pointers and MP3 players and use it instead for something that you may actually stand a chance of needing and, while we’re at it, save a whole chunk of cash in the process. The only thing that does seem to come in handy – and is used frequently, I must say – is the standard blade. So with this being the case I put it to you: why not take just that? A little penknife for cutting/peeling fruit etc. is ideal and a must have - but bigger certainly is not better. The smaller the penknife is, the less space it’ll take up in your pocket, the less likelihood there is of it painfully digging in your crotch on a long bus journey, and the less it’s going to cost also. And if you’re as cheap as me, you can always wait to buy it at your destination to save even more cash. For instance, markets in lesser developed countries still sell penknives (presumably because they’re handy the world over) and for a half decent one they may only set you back a dollar or 2 – a fraction of the price of their equivalent back home. That alone could make a difference for those travelling on the uber-cheap - every little helps, as they say. But even if spending a couple of extra bucks on a small knife back home doesn’t break the bank, simply choosing that over the state of the art Leatherman tool will still save you a fistful of cash. The other bonus of a cheap penknife is that if it does fall out your pocket (and I’ve lost my fair share) or it gets confiscated for some reason, then money wise you’ve lost virtually nothing. Use a lighter/edge of a wall/spine of a book/almost anything know to mankind – it’s truly amazing how creative you can get when desperate for beer. Nb. When combined with cigarettes, a lighter also doubles as a way of looking really cool. Dual purpose bonus! Either use a pencil or a stick or something similar to push the cork down into the bottle or, if the cork just won’t budge, use the blunt, narrow edge of a solid implement and repeatedly run it up the neck of the bottle and across the ridge at the top (each run a little harder than the last) until it the light chinking sound turns to a crack. You can then carefully pull the top half inch of the glass away with the cork still in it - but don’t do this with your bare hands! Of course, you will now need something to drink the wine out of as, curiously, the neck of the bottle is now rather sharp - but you have Tupperware, right? I’ve never felt the need to cut them away from their rightful owners, but I’m sure I could find a way of detaching them if my life depended on it. I’m certain there must be alternative ways of doing this, but c’mon, who wants to burn a little beetle? Even if you just need to magnify something, unless it has teeth and/or highly potent day-ruining venom there’s generally the option of actually moving your head closer to it. Yeah, that trusty little penknife again. Stubborn items removed from horses hooves: 0 in 33 years and counting. As ever, I speak as I find and can only base this on my own experience. You’re story may be different. 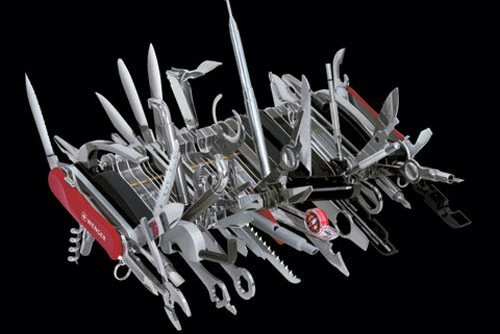 Whilst on the road, have you ever needed (and I mean needed as nothing else would’ve done) a Swiss Army Knife? Has it got you out of a sticky situation as nothing else could’ve? If so, we’d love to hear your story. Or, like me, were you one of those people who would always carry it “just in case” but only ever use it to a fraction of its potential? In fact, maybe you still carry one because you strongly believe that one day all those gadgets really will come in handy. 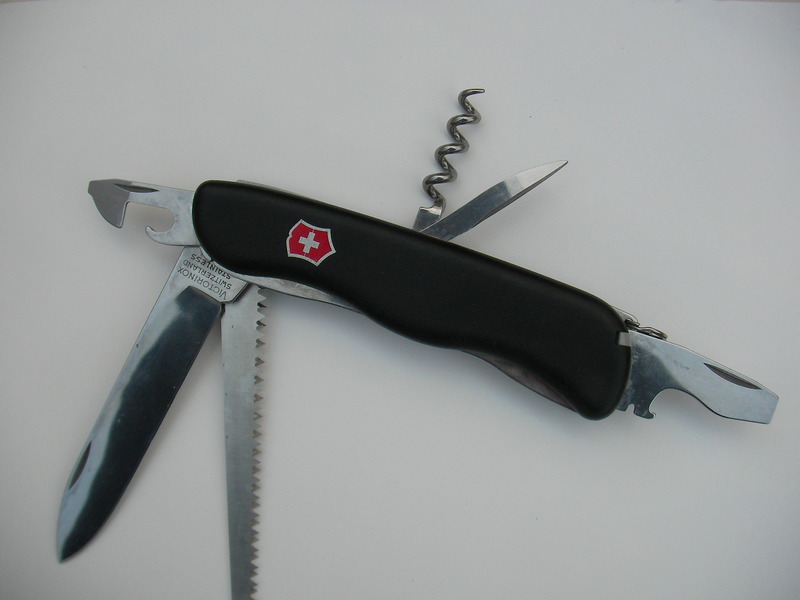 So, do you think the the good old Swiss Army Knife is a backpacker essential or a complete bullsh*t waste of money? Ubertramp is the brainchild of freelance travel writer and inveterate cheapskate Nath Richards. On occasion, he's been known to write for cash, food or friends - but never to flash for coins or publicity. If you enjoy his articles and want one for your own publication then drop him a line. Unless hungry, he's quite approachable. Apologies, Ubertramp, but I side with the Swiss army on this one. But I do admire your bravery for challenging the sacred ground upon which the Swiss Army knife traditionally sits for nearly every traveler on this planet. Wade from Song of the Open Road sends you a big high five for treading such an unblazed path. My only regret is that I must astutely defend one of my most trusted sidekicks- the Swiss Army Knife. (Hmm, what is Andy’s take on this? Traveling Chris, are you out there? Byron? I know you are out there; Loren? I don’t think he will waste his time reading this; Erik the Pilot? I know you carry your Swiss Army knife next to your shotgun). What do you now think about the Swiss Army Knife? Do you think that it is a backpacking essential, or "just another travel rip-off?" Make your opinion known on this most sensitve travel topic! Just copy and past the comment form below and email it to VagabondSong@gmail.com and I will publish it here! Now I am no wordly traveler mind you, but I have carried a swiss army knife every friggin day since I got out of high school and was allowed to carry it (about 7 years now). Even though I am not often braving the wilds of the rainforest or the back alleys of a far off city, I use my knife almost daily and cant beleive that someone who doesnt have the convenience of a toolbox in the basement while traveling wouldnt appreciate having a small swis army knife... nobody says you need a huge one with magnifying glasses and laser pointers. The philips head screwdriver is priceless and I cant tell you how many times I use my scissors as wire cutters or nail clippers. I have used the tweezers for slivers and tics (dont know how upset I am since i lost my tweezers after getting that tick) and can opener for cans of tunafish and obviously bottle opener for all sorts of bottles... I worked with your dad doing sheet metal for a few summers and used that damn knife for five years until it was beat to hell (I used to use the flat head screw driver as a wedge and beat the other end with anything heavy like a rock or hammer). I love my knife and can proudly say that it saves my skin in ways that no regular pocket knife could... this coming from a guy who spends most of his time working at a desk all day (oh yeah, and those knives are great for fixing laptops on the go and cars too). I tried a leatherman but do beleive that they are way too big for convenience and the only bennefit would be the pliers... not worth it most of the time. I always carry my Swiss Army knife in my backpack wherever I go, even to class. I think I have honestly used every tool on it. You never know when you may need it; opening a beer at the beach, opening a can of beans while camping, knife for cutting rope, I have even used the little scissors. It is just an extremely useful tool. I mean, why would you carry all those things seperately when they are all included in one multi-purpose tool? I can see why you might not need it if you were staying in hotels all the time, but for the backpacker or camper it is essential. I have traveled for 10 years and can say, the Swiss Knife is a very bad value for the money, however would carry if they sold for 2 dollars, then dump it when I needed space in my pack. The pen knife is not good for Pineapples, so I buy a table knife and try not to put holes in the side of my bag. Truth is, I borrow knives most of the time, everyone seems to have this need to have a knife. I did carry a sword in Thailand for protection for a while, but found a sock full or rocks is easier. Keep up the good work, please go after the Camel Water bag, or maybe you already have, this is an the wire mesh cover for bag where they can still put their hand in and be a temptation, casual thief. Please, we need more bad guys of travel to debunk some of this travel gear crap that is worthless.